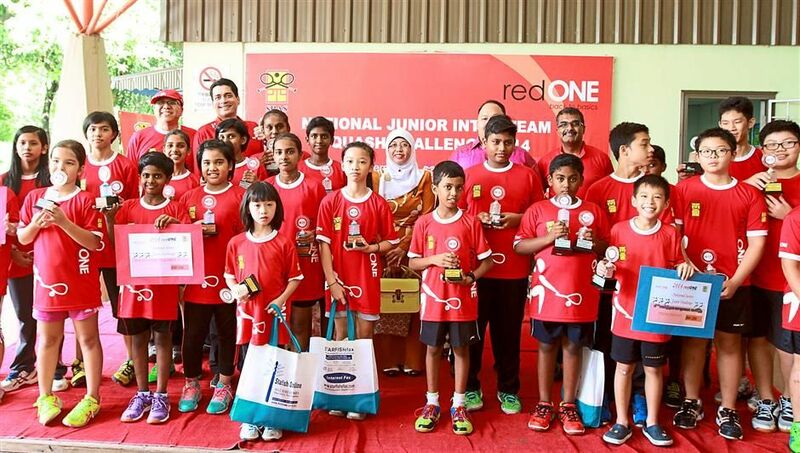 SELANGOR squash juniors did well at the redONE National Junior Inter-team Challenge 2014 by coming in champions and first runners-up in the boys and girls categories recently. The junior event drew participation from Selangor, Federal Territory, Malacca, Perak, Pahang, Terengganu, Kelantan and Kedah. The teams met each other in a best-of-five format in categories of under-9 (1 player), under-11 (2 players) and under-13 (2 players). Squash Racquet Association of Selangor (SRAS) vice-president Sivanesan C. Arul Chelvam was delighted with Selangor’s performance. “Despite entering the matches as third and fourth seeds, they boys and girls played well to improve from that position. (Back row) Squash Racquet Association of Malaysia vice-president Huang Ying How, redONE chief executive officer Farid Yunus, MBPJ sports development and general facilities senior assistant director Zaharah Rustam, Selangor State Sports Council development deputy director Mohamad Nizam Marjugi and Sivanesan with the winners from the girls category Kedah and boys category Selangor (A). “Playing Kedah is always tough and while our girls came in second to Kedah, the boys outdid themselves by edging favourites Kedah out in a nail biter of a semifinals,” he added. The boys final saw Selangor (A) trade blows with Federal Territory (A), pushing it into a decider in which Jonathan Lau defeated Hari Roshan 3 games on the trot. The event, organised by SRAS and sanctioned by Squash Racquet Association of Malaysia (SRAM) was held at the Astaka sports complex. SRAS intends to use the tournament as a platform for young and aspiring juniors to further hone their skills and raise the level of junior squash players in the country. Working together with SRAM, the juniors who excel will eventually be taken under SRAM’s wings for further grooming while SRAS’ interest lies with the younger juniors. “It all starts with the states and their associations. If we don’t have a grassroots programme, the national body will not have anyone, so everyone has a role to play,” Sivanesan said. “We are focused on the juniors at the grassroots level, so the more players we have the better the chances are for us to uncover future talents,” he added.